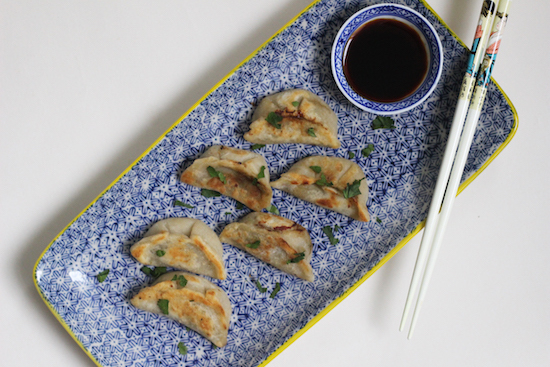 Emily's Recipes and Reviews | UK Food Blog | Leicestershire : miso mushroom gyoza. An exciting parcel arrived on my doorstep recently. An exciting parcel bursting with organic goodies. To celebrate Organic September, Organic UK had sent me a variety of fresh, dairy and dry produce to get creative with. From vibrant fruit and vegetables to soy sauce and plain flour to pasta, there were lots of ingredients to play around with in my #OrganicUnboxed package... even wine! I hadn't realised so many foodie products could be organic and couldn't wait to experiment. After getting my thinking cap on, I knew I had to use the red miso paste and soy sauce to create something Japanese inspired. And so I present to you... homemade miso mushroom gyoza featuring and organic mushroom filling, pastry made from Doves Farm flower and Clearspring soy sauce for dipping. Yum - and they're vegan too! Step one. Begin by making your gyoza dumpling pastry by slowly pouring the boiling water into a bowl of flour. Stir with a knife. You may need a little more than 100ml, but it is ready when it comes together in a ball. Cover with cling film and chill in the fridge for at least an hour. Step two. Meanwhile make the mushroom filling by whizzing together the ingredients in a blender. If you don't have one, roughly chop until fine and stir through the miso paste and soy sauce. Step three. Roll out the dough as thinly as you can on a floured surface. Cut into circles and place a teaspoon of mixture in the centre. See my king prawn gyoza recipe for more pictures of how to fold gyoza. Step four. The mixture should yield 10-15 Japanese dumplings, which are ready to cook straight away! Step five. Simple heat your your pan with your choice of oil (sunflower, vegetable or sesame oil is fine). Fry off for ten minutes, continuously turning. The mixture isn't raw so you mostly need to make sure the pastry is golden brown and cooked through! Serve up with sprinkles of extra coriander, red chilli flakes if you wish and soy sauce for dipping! Have you ever made homemade gyoza before? Or experimented with Japanese recipes? I would love to hear about any organic recipes you'll be creating this month! Here are a few of my other organic treats - the wine was wonderful! I made a ratatouille with the vegetables and enjoyed the fruit with yoghurt - however I'm still yet to try the pasta!